London-based publication Times Higher Education (THE) has placed the University of the Philippines in the top 50 percent of the 2018 Emerging Economies Universities Rankings. UP has been ranked 166th, a massive leap from its 201st-250th position among 300 universities in 2017. 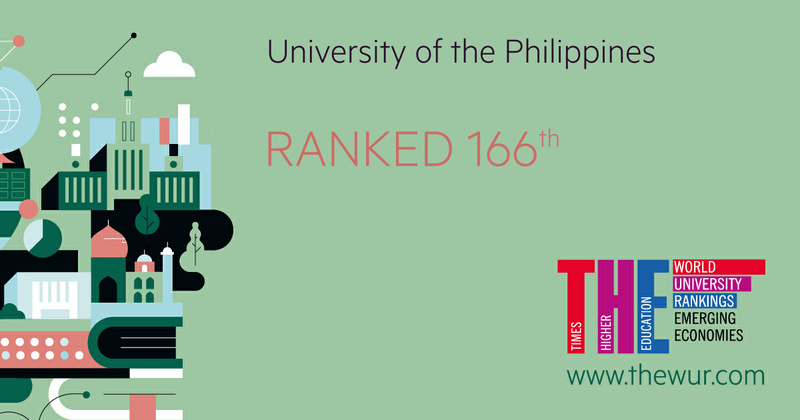 It is the only Philippine university in this year’s list which includes 378 universities from 42 countries. The rankings consider only institutions from countries classified by FTSE as advanced emerging, secondary emerging or frontier markets. THE evaluates their accomplishments in teaching, research, knowledge transfer and international outlook based on the same indicators used in the World University Rankings. But to better reflect the characteristics and development priorities of universities in emerging economies, THE gives more weight, for example, to university-industry links and international outlook. Of the 50 nations deemed emerging economies, only 42 countries have been represented in the top 378. “So [UP’s] place in this ranking of the best research-led universities among the emerging economy nations is a significant achievement,” according to Phil Baty, editorial director for global rankings of THE. UP continues its rise in world and regional rankings. In February, it made a significant jump in the 2018 THE Asia University Rankings in which it climbed to 156th from 201st-250th, and before that in the World University Rankings in which it moved into the 601-800 bracket from 801-1000. THE publishes some of the most closely watched rankings in the academic community. When UP entered the Emerging Economies Universities Rankings (then called the BRICS & Emerging Economies Universities Rankings) for the first time in 2017, it was also the lone Philippine institution that was ranked.